The entire Temple of Ramesses III, palace and town is enclosed within a defensive wall. Entry is through the Highgate, or Migdol, which, in appearance resembles an Asiatic fort. Just inside the Highgate, to the south, are the chapels of Amenirdis I, Shepenwepet II and Nitoket, wives of the god Amun. To the north side is the chapel of Amun. These chapels were a later addition dating to the 18th Dynasties, by Hatsepsut and Tutmose II. Later renovations were done by the Ptolemaic kings of the XXV Dynasty. 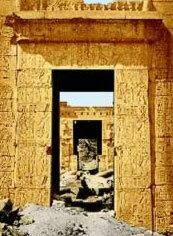 To the west is the temple proper, which was styled after the Ramesseum. On the north wall of the temple are reliefs depicting the victory of Ramesses with the Sardinians, Cretans, Philistines and the Danu. This was perhaps the greatest victory in ancient Egypt. Pharaoh watched as the invaders crossed the plains, destroying everything in their path. The multitude came with oxen-drawn wagons, laden down with all of their possessions, their families and their newly discovered iron weapons. No tribe or settlement was able to survive their passing. The horde came over the land and the sea heading straight for Egypt. Ramesses gathered together his army and defeated the land invaders. He then proceeded to the shore to meet the ships. Ramesses archers released their arrows against the landing ships. (The Egyptians's had an advantage over the enemy; the Egyptian's ships had both sails and oars, while the invader's had only the sail.) The Egyptian army then rowed out to sea and overturned the invaders' ship, drowning all that survived the archers' attack. These are the only know reliefs of a sea battle in Egypt. The Egyptians were excellent accountants and counted everything that was taken from the enemy and all that were slain. The reliefs show the bookkeepers counting the spoils. Entering through the massive Pylon (27m high and 65m long) is the First Court where athletic sporting events, such as wrestling, were held. Reliefs on the south wall are of Ramesses' victory over the Libyans and the Window of Appearances is on the west wall, flanked by eight columns. Behind this lies the audience hall with the kings' shower room nearby. The stone tank is still intact. On the east side are seven Osiride pillars. The Second Court, accessed via ramp up and through the Pylon, is made up of eight Osiride pillars and six columns. Of the scenes in the Second Court are the Feast of Sokar and the lower part of the back wall being dedicated to Ramesses children. Of interest in the entrance at the right end of the hall is a relief of Ramesses kneeling on the symbol of Upper and Lower Egypt and a defaced scene of Ramesses before Seth, with the Pharaoh changed into Horus. The Hypostyle Hall through the west entrance was badly damaged in 27 B.C. by an earthquake. Originally, The Hall would have opened into many rooms but none remain due to the earthquake. Close to the temple is the remains of a Nilometer. These 'flood warnings' were positioned strategically along the river to determine the position of the river every year. Not only did these register the height of the river, but also determined the amount of silt that was being deposited. With this information, the governors could, in advance, determine which crop would thrive and thus base the tax levy.